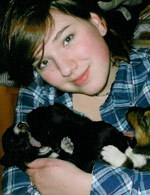 Cassia Condon, 17, started mushing three years ago. About half her dogs are from Jeff King’s kennel. She broke her thumb during training last year and had to have major surgery so she couldn’t race. An 11th grade student in the IDEA Home School, Cassia says she enjoys playing the bass guitar, breeding and training horses, air soft guns and building forts. After graduation, she says she plans to continue racing in limited class sprint races, and she plans to get married.